Cornerstone laid September 3, 1893. Picture of the Holy Trinity Choir taken February 4, 1915 - with all members identified! "I remember a very lovely reception given to my family by the congregation on our last Sunday with you. Since that time we have moved on in many ways, and I am happy to report that the family seems to be doing well. I hope the same applies to our former friends at Holy Trinity." Nineteen hundred eighty-nine marks the one hundredth anniversary of the life and work of the Holy Trinity Evangelical Lutheran Church of Wallingford, Pennsylvania. Following the preliminary organization in January, 1889, the constitution was prepared, read, and adopted later in the same year. The beginning of this church was modest, but the devoted efforts of many of the early people made the foundation firm enough to carry it safely through the early years. Congregational activity increased rapidly with the coming of the first regular pastor late in 1889. 1890 saw the beginnings of the Ladies' Aid Society and the Young Peoples' Association which later became the Lutheran League. Since the early church members were not satisfied with Cutler's Hall as a place of worship, they moved to Kepner's Hall, also at Third and Kerlin Streets in Chester, Pennsylvania, where they worshipped for one year. During this time the property at 317 Kerlin Street was purchased, and on August 16, 1893, ground was broken for the first church building. The cornerstone was laid on September 3, 1893, and the first service was held there on January 7, 1894. The parsonage at 501 Kerlin Street was purchased in 1902. The Sunday School building was added to the church in 1910. Many gifts were made to the early church. These included collection plates, a brass cross and altar flower vases, a bronze lectern, new pews, electric chandeliers, a Missal stand, alms basin, Baptismal Font, weekly altar flowers - - which continued for many, many years, and in 1916 the altar painting, "The Risen Christ" by Fra Bartolomeo, presented by Dr. C. Charles Ernst. Early in 1916, the Men's Brotherhood was formed as a result of a gradual transition from the Men's Bible Class. In conjunction with the Ladies' Aid Society, this group was active through the years improving the church property and forming the basis of Christian fellowship. The year 1919 saw the founding of an extension, Christ Sunday School, in Marcus Hook and the organization of Chester's second Lutheran Church, Nativity, in North Chester. These efforts were to serve a geographically spreading congregation and to enlarge the outreach of the church. Holy Trinity struggled through the financial depression of the early thirties, most of the time barely able to meet the annual budget. During this time, however, the men of the congregation renovated the interior of the church and parish house. Though often disappointed financially, the men and women of Holy Trinity displayed that same Christian faith which united and sustained the founding members of this first English Lutheran Church in Chester many years before. As the pall of economic depression began to lift, the church was rounding out fifty years of organization. Holy Trinity celebrated its golden anniversary from September 24, 1939, through October 8, 1939, with appropriate services. Its people were happy with their many blessings and anxious to push toward even greater work. The new Ernst organ, dedicated during the anniversary celebration, brought great joy to those who worshipped; and soon other gifts improved the atmosphere. Only the apparent illness of the spiritual leader cast a shadow over the people. The congregation received a stunning blow on October 11, 1942, when ill-health forced the beloved Pastor Weaver to resign after sixteen years as shepherd of the group. He was retained as Pastor Emeritus until his death on March 22, 1943. The Rev. George B. Ammon was called from the Brickerville Parish to Holy Trinity on January 1, 1943. Under the leadership of Pastor Ammon the congregation quickened its pace somewhat. 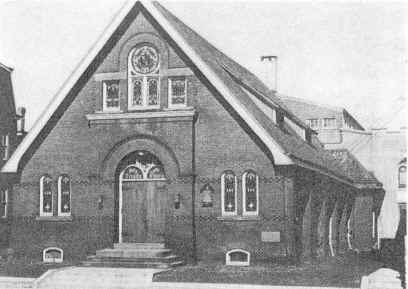 A branch Sunday School was established in McCafferty Village. Both a Boy Scout and Girl Scout troop were formed. A Junior Choir and Intermediate Luther League were established. More gifts of useful items came to the church. 1945 found the congregation becoming actively concerned about the need for a parsonage in a new location, and, in December, they sold the property at 501 Kerlin Street. Then, again, Holy Trinity found it necessary to call a new pastor. Rev. Ammon resigned on January 4, 1946, to become manager of the new Audio-Visual Department of the United Lutheran Publications House. The congregation called Rev. Wilmer F. Furman, recently a chaplain in the United States Army, to come to Holy Trinity on March 1, 1946. The new pastor and his family were able to move into the recently purchased and renovated parsonage at 2017 Melrose Avenue in Chester. There was now great need for improved physical resources for the Sunday School. Investigation showed that considerable money would be required to produce the improved church plant that the congregation envisioned. A special meeting of the congregation was called on March 23, 1947. Following a lengthy discussion on the question of renovation or relocation, the church council was authorized to negotiate the sale of the church property. On July 13, 1947 another special meeting authorized the sale of the church property to A.M.E. Zion Church. Now the congregation was faced with the task of relocating. In the meantime, they accepted the offer to use Trinity Methodist Church at Eighth and Butler Streets in Chester, for their worship services. With Pastor Furman's guidance, the Church Council studied the dispersion of the congregation, available adequate space, and areas of possible membership expansion. They finally suggested that the congregation purchase the present church site of six acres with the stone house, garage, apartment, and household effects from the Allen family in Wallingford, for $65,000.00. An architect had pronounced the main house suitable for conversion into a chapel with classrooms and fellowship hall. The servant's apartment and garage were adequate for conversion into a parsonage. The congregation agreed to this purchase on November 16, 1947. The decision to relocate was merely the beginning of long hours of effort for many of the faithful members. Council members and a special committee searched and studied methods of financing. Some of the people gave generous monetary assistance. The parsonage at 2017 Melrose Avenue was sold. The renovations to the chapel and parsonage were watched closely and frequent plan changes made to keep the remodeling costs within reach. A music committee searched for an organ and finally decided on a Hammond Electric Organ which was available for $1,600.00. In September of 1948, the Council presented the idea of a bond issue to be floated to aid in reduction of the debt. This was reasonably successful. At last the thrilling occasion arrived when the homeless congregation of Holy Trinity was united again for worship in its own church. Christmas Eve of 1948 was a time of true rejoicing. Amidst the ever new thrill of celebrating the Christ-child's birth ran a thread of joy and thanksgiving in worshipping in their own chapel. Small and simple it was - - but it held the promise of future growth. There was still a tremendous financial debt to overcome and at times it seemed that faith alone would have to pay it. But an answer always presented itself. By October of 1949, sufficient progress had been made on the new church to hold a service of dedication. Dr. Emil F. Fischer, President of the Ministerium of Pennsylvania, delivered the principal address at this service on October 23, at 3 pm. Pleasant weather permitted the service to be held on the church grounds, followed by a tea. A year later, in October of 1950, the cornerstone of the old church was removed and sunk in the rose garden in the rear of the present church. In spite of the press of finances, the congregation continued its efforts to spread the Gospel. A bus route was begun to bring the children to Sunday School. The Sunday mornings were devoted to two services for the growing congregation. And then another adjustment was necessary. Pastor Furman was called by the Board of American Missions on November 1, 1951, to serve in Davenport, Iowa, in the Home Mission Field. The congregation called Rev. Julius Kish from Holy Spirit Church in Philadelphia. On January 1, 1952, he assumed the task of guiding and helping the people of Holy Trinity. Under the capable leadership of Pastor Kish, the congregation began to expand in numbers and in works. Innovative programs were instituted. The men and women actively worked to improve the physical appearance of the building. Simultaneous with all of this activity was a continuing effort to reduce the church debt. The move to the new location had cost a total of $151,474.25. This included the cost of the chapel chairs, chancel furnishings, and organ as well as the property cost, renovations and parking lot finishing. The congregation gave constantly through individual and organizational gifts, two talent programs, and through special weekly offerings. They also supplied numerous gifts to add to the beauty of the church. By the end of 1953, six years after the initial step, $125,199.25 of the debt had been paid. This left only $26,775.00 remaining as our goal in 1954. In 1954 the congregation celebrated its sixty-fifth anniversary with renewed vigor and a series of special services throughout June. Foremost in their thoughts was the planning for a new sanctuary. January, 1957, marked the approval of plans for the building of the new sanctuary for 500 people to cost approximately $176,000.00. The ground-breaking took place on May 19, 1957. Throughout the summer the congregation watched their plans become a reality. The original cornerstone was removed from the rose garden and set in the ground beneath the cornerstone of the new building on September 29. Christmas Eve was memorable. Walking over the rough concrete floors, sitting on chapel chairs, and looking toward a makeshift chancel and altar, the congregation celebrated the joyous Nativity in their new sanctuary. Once again the congregation gave special gifts to adorn their place of worship - - pews, an illuminated cross above the altar, flower stands, vases, candlesticks and many other useful and lovely items. The new building was dedicated on May 4, 1958. The Rev. Julius Kish, after eleven years of service, resigned on May 31, 1963, to become Superintendent of the Chester Rescue Mission, Chester, Pennsylvania. Until February of 1964, the congregation struggled to continue its service without a pastor. The Rev. John M. Scherch came from Sayre, Pennsylvania, to pick up the reins of spiritual leadership. Pastor Scherch encouraged the congregation to look beyond its own needs to those of the community. Meeting the needs of a larger parsonage family eventually resulted in the purchase of the Levis property in December, 1966, for $39,000.00. This provided not only a larger parsonage, but also a property adjoining our existing one, supplying ample space for future planning. Much work was done over the next several years in research and planning for program and building expansion - - work that did not bear mature fruit. Rev. Scherch resigned in September, 1971, to accept a call in Oreland, Pennsylvania. Fortunately for the congregation, John Barton had become an intern prior to the pastor's leaving. John, later pastor of First Lutheran Church in Collingdale, Pennsylvania, carried on much of the work expected of a full time pastor. He smoothed the way for the leaderless congregation until the arrival of the Rev. Russel L. Brubaker, Jr. Pastor Brubaker came to us on May 1, 1972 from Kulpesville, Pennsylvania. He was diligent in spurring us on toward improving our faith, ourselves, our service, and our physical facilities. The year 1974 saw two major events in the history of our congregation. Not only did we celebrate our 85th anniversary, but, at a special congregational meeting in June, a decision was made to continue our building program by adding the present educational wing and Fellowship Hall. Well over $102,000.00 was raised for this building which was completed in 1975. Following the resignation of Pastor Brubaker in 1980, we were without a pastor for many months. Our pastoral needs were capably met by the Rev. Robert Nagle and Pastor David Anderson. The Rev. James A. Hulihan was installed as our present pastor on January 25, 1981. Throughout the next several years, the congregation attempted to establish a firm financial base as well as to improve our physical plant and our social ministry. The old parish house and the former parsonage were sold. In 1981, The Keen-Agers, a service and social group for older members, was organized. A ramp was added at the side entrance of the building creating access for the handicapped to both the sanctuary and Fellowship Hall. This was dedicated in December, 1983 as a memorial to the Rev. Arthur Chatten, a "Son of the Congregation." The ever-active Lutheran Church Women created seven needlepoint kneeling cushions of original design to serve the altar rail. These were dedicated as a memorial to Jean Peel Coslett, long an active member of our congregation. An Information Center was constructed in the rear of the sanctuary by restructuring one of the cloak rooms. Space for storage of outdoor equipment was added to the educational wing. A Cross Garden, with the original stone Baptismal Font as its focal point, was created. An attractive and highly visible illuminated church sign was erected on our lawn to invite passers-by to join us in worship. 1985 found us happily "Burning the Mortgage" and celebrating our debt-free status. Much discussion regarding the cost and comfort factors relative to air conditioning versus wall fans for summer use resulted in the installation of fans in 1986. The amplification system was enlarged and improved. The week-day Nursery School which began in 1970 continues to evolve as an important service in our community. Alcoholics Anonymous meets weekly in our building as they have since 1974. The Social Ministry Committee of the church adopted Wesley House in Chester, a haven for the homeless, as an on-going project. [Editor's note: The Wesley House is located in the former Madison Street Methodist Church building at 7th & Madison Streets.] This continues, as it has since the fall of 1984, with financial and personnel support. In April of 1986, we decided to sponsor a refugee family - - a decision that required hours of dedicated service by many people along with financial help. Mr. Jaramir Knopp, his wife and son came to us from Czechoslovakia and were established in an apartment furnished by the congregation. The family made a successful adjustment to a new country with the help of volunteer tutors, shopping aides, and general help from the congregation. Holy Trinity expanded its work with the East Side Ministry in Chester by initiating a children's summer lunch program. Meanwhile, we continued to share our bounty with others. Lutheran Charities and World hunger Appeals were supported. While 1986 was a busy year for our own congregation, it is also worth noting that the "Constituting Convention" for the merger and reorganization of several large Lutheran church bodies was taking place in Ohio in April. It is proposed that the 5.3 million member Evangelical Lutheran Church in America will consist of 11,000 congregations. During this year we continued to reach out to others by pledging $12,715.00 to "One In Mission." September of 1986 brought William Krill as a consultant to our Youth Group. With the support of a dedicated parents' group, Bill established a core of active young people. This work continued with the assignment of Seminarian David Diamond. Today, the youth have many fine outlets for service and fun. The Organ Fund, established in 1981, was the seed for a pledge drive for a new organ to replace the forty-year-old electric one. The congregation voted in 1988 to purchase a Wicks pipe organ for approximately $100,000.00. With our outstanding and dedicated musicians, it is an integral part of our One Hundredth Anniversary Celebration in 1989. The new Evangelical Lutheran Church in America named The Rev. Lawrence L. Hand as the first Bishop of Southeastern Pennsylvania. He was installed by Bishop Herbert Chilstrom in a service held in the Cathedral Basilica of S.S. Peter and Paul in Philadelphia in April of 1988. Representatives of our congregation attended. Many people have served and others continue to give of their time and talent to ensure that Holy Trinity will grow and prosper in its endeavor to provide service, outreach, and the teachings of the Gospel to the community and the world at large. This history is written not to close the records of the past century, but to reveal our great heritage. We trust that we will move from this anniversary celebration into the future with gratitude to God for His abundant blessings. We pray His help in the future which lies before us - - may it be filled with fruitfulness in the work of the Kingdom. "On December 7, 1998, there was a fire at the church started by an arsonist. The congregation worshipped in the fellowship hall from Dec.1998 until Good Friday of 2000 while the sanctuary and offices were renovated." � 2000, 2001, 2006 John A. Bullock III.